Life after college graduation is thrilling... until you try to find somewhere to live. Entry level salaries coupled with sky-high rents in the country's most desirable cities often makes finding a place more of a headache than a happy ending. As experts at Trulia found, new grads can't really afford to live anywhere among the country's 25 largest rental markets. 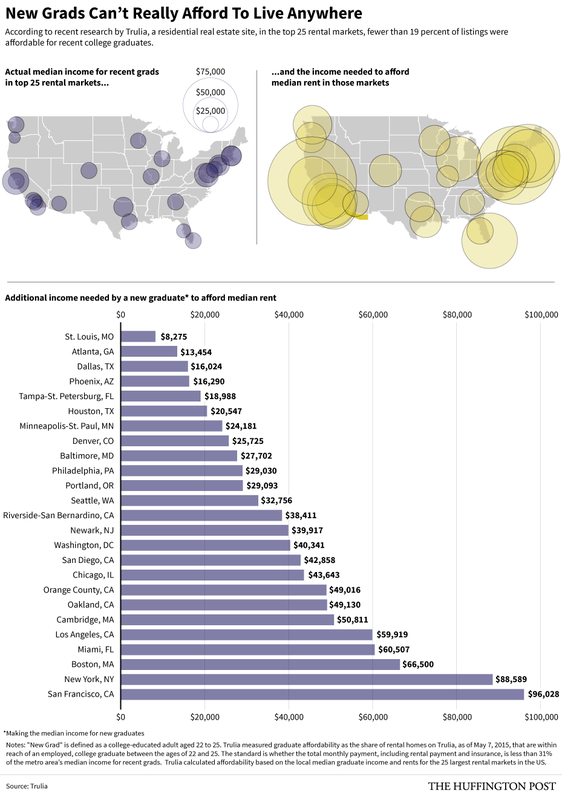 While the median annual income for new grads ranges from about $16,000 to about $41,000 in these cities, the income needed to afford median rent is two to three times that -- assuming grads don't want to spend more than 31 percent of their income on rent. You can see this on the map below: A purple circle is how much money recent grads typically make, and a yellow circle is how much they'd need to make in order to afford median rent. The bar chart tells precisely how much more they'd need to make to afford rent -- and the numbers are not pretty. At worst, this effect means just .1 percent of rentals are affordable to new grads in Portland, Oregon. At best, it makes just 18.6 percent of rentals affordable in St. Louis, Missouri. Any way you slice it, it's a pretty rough welcome to the "real world."